APPEARANCE: Taira no Masakado was a samurai of the Heian period, a powerful warrior, and a great leader. He was born either in the late 800s or early 900s CE and was killed in 940. After his death, his spirit is said to have returned as a vengeful ghost and brought destruction across the country. 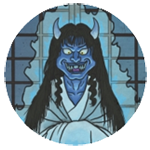 Along with Emperor Sutoku and Sugawara no Michizane, he is one of the Nihon San Dai Onryō—Three Great Onryō of Japan. Though Taira no Masakado’s birth date is unknown, he is believed to have been born sometime around when Sugawara no Michizane died. A Meiji period biography of Taira no Masakado suggests that he may have been Sugawara no Michizane’s reincarnation; his revolt against the emperor may actually have been a continuation of Michizane’s curse. ORIGIN: Taira no Masakado was born into the Kanmu Heishi, the clan of Taira descended from Emperor Kanmu. It was an elite family. Masakado had a privileged childhood in the capital, after which he settled down in Shimosa Province in Eastern Japan, northeast of modern day Tokyo. His troubles only began after his father died. Inheritance laws at this time were not firmly established, and his uncles tried to steal most of his father’s land. They claimed their royal lineage gave them the right to do so. In 935 CE, the dispute with his family members broke into outright battle. Masakado was ambushed by one of his uncles and a number of Minamoto warriors. But Masakado was a powerful warrior. He quickly defeated them, and then took his revenge by burning their lands, ravaging the countryside, and slaughtering thousands. This brought him into conflict with other relatives by blood and by marriage, who brought their dispute to the emperor. Taira no Masakado was summoned to court to answer charges of the relatives of the dead Minamoto warriors. Masakado was not only brave, he was also smart. He had taken great pains to remain within the law and proved that he had good reason for his killings. After only a few months, he was fully pardoned when the court offered a general amnesty in commemoration of Emperor Suzaku’s coming of age. Taira no Masakado returned to his home, but soon found himself under attack. This time, it was his father-in-law and his relatives. Again, Masakado quickly defeated them. To avoid stirring up more political trouble, Masakado received a warrant to apprehend his attackers. Now, with legal sanction for his military action, he stormed into their lands on a quest for revenge. In 938 CE, Taira no Masakado received another court summons for questioning about a quarrel with one of the cousins who had attacked him. This time, Masakado ignored the summons. He raised a large force and invaded Hitachi Province. He conquered eight provinces: Shimotsuke, Kozuke, Musashi, Kazusa, Awa, Sagami, Izu, and Shimosa. The whole time, he maintained his innocence, insisting that his campaign was legal under the terms of his warrant. The government was seen as ineffectual and the nobles as abusive by the peasants of the time. Taira no Masakado, on the other hand, treated the peasants of his conquered domains much better than their former masters did. His insurrection was seen as a salvation by many peasants. They welcomed him gladly. The court feared that Taira no Masakado was preparing to overthrow the government and declare himself the new Emperor of Japan. He was condemned as a rebel and a traitor. A number of warriors—including Masakado’s ally Fujiwara no Hidesato and some his own relatives—were commissioned by the government to take his head. They caught up with Masakado’s army in Shimosa province on the fourteenth day of the second month of 940 CE. They attacked during a night ambush and quickly defeated the rebels. Masakado’s men were outnumbered ten to one. 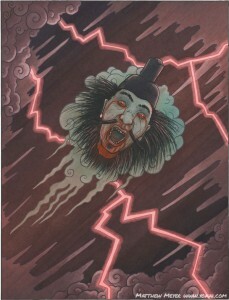 Masakado was beheaded, betrayed by his friends and family. The head was brought back to Kyoto to be displayed in the east market as a message to would-be rebels. LEGENDS: Strangely, Taira no Masakado’s head did not decompose. Many months after it was first displayed in the east market, it still looked as fresh as the day it was severed. The eyes had grown fiercer, and the mouth twisted up into a hideous grimace. Night after night the head would call out, “Where is my murdered body!? Come here! Reattach my head and let me fight once again!” And then things got really strange. One night the head began to glow. It flew off into the sky, across the country, towards Shimosa. The head eventually grew tired and landed to rest in a fishing village called Shibazaki (which would one day grow into the city of Edo). The villagers who found the head cleaned it and buried it. A shrine was erected over the grave and named Kubizuka—the mound of the head. Masakado was honored and worshipped by the peasants as a true warrior, a symbol of justice who stood in heroic defiance of a corrupt and lazy nobility. He was seen as an underdog who was repeatedly betrayed and eventually murdered by those he should have been able to trust. Despite his deification and popularity among the lower classes, his ghost was not appeased. A few years after his head was buried, the ghost of a samurai began to be seen in the neighborhood of his shrine. In the early 1300s, a great plague struck Edo. Many people died. The plague was attributed to Taira no Masakado’s anger. In order to appease him, his spirit was moved from his small shrine to the larger and more prestigious Kanda Shrine. He was designated one of the main gods, and his spirit was placated—for a while. In 1874, Emperor Meiji visited the Kanda Shrine. It was viewed as inappropriate for an enemy of the imperial family like Masakado to be honored when the emperor was visiting, and so his deity status was revoked. His shrine was moved to a smaller building outside of the main shrine. Taira no Masakado’s anger returned in 1928. After the Great Kanto Earthquake destroyed much of the city, the site of his Kubizuka was chosen as the temporary location for the Ministry of Finance. Shortly afterwards, the Minister of Finance became sick and died. Over a dozen other employees died, and even more became sick or were injured in falls and accidents in the building. Rumors about the curse ran began to spread. The Ministry of Finance building was demolished and a memorial service for Masakado was held at the Kanda Shrine. Throughout the 20th century, a number of other accidents, fires, sicknesses, and mysterious sightings were attributed to the curse of Taira no Masakado. Each time, purification rituals were performed. Finally, in 1984, in response to public pressure, his deity status was reinstated. Today, great pains are taken not to anger his ghost. For example, it is common practice for television stations to visit the grave of his head, still located in what is now Otemachi, Tokyo. They pay their respects to him before his character appears on any show. The Kubizuka is maintained by an organization of local businesses and volunteers who have taken on the responsibility of upkeeping of his grave.